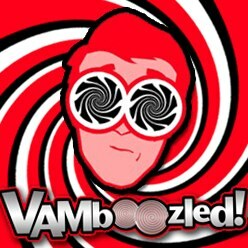 After I posted about “Observational Systems: Correlations with Value-Added and Bias,” a blog follower, associate professor, and statistician named Laura Ring Kapitula (see also a very influential article she wrote on VAMs here) posted comments on this site that I found of interest, and I thought would also be of interest to blog followers. Hence, I invited her to write a guest post, and she did. If there is some bias present in value-added estimates, and some bias present in the observational estimates…perhaps this is why these low correlations are observed. That is, only those teachers teaching classrooms inordinately stacked with students from racial minority, poor, low achieving, etc. groups might yield relatively stronger correlations between their value-added and observational scores given bias, hence, the low correlations observed may be due to bias and bias alone. Here, Audrey makes the point that a correlation of r = 0.28 is “weak.” It is, accordingly, useful to see an example of just how “weak” such a correlation is by looking at a scatterplot of data selected from a population where the true correlation is r = 0.28. To make the illustration more meaningful the points are colored based on their quintile scores as per simulated teachers’ value-added divided into the lowest 20%, next 20%, etc. In this figure you can see by looking at the blue “least squares line” that, “on average,” as a simulated teacher’s value-added estimate increases the average of a teacher’s observational estimate increases. However, there is a lot of variability (or scatter points) around the (scatterplot) line. Given this variability, we can make statements about averages, such as “on average” teachers in the top 20% for VAM scores will likely have on average higher observed observational scores; however, there is not nearly enough precision to make any (and certainly not any good) predictions about the observational score from the VAM score for individual teachers. In fact, the linear relationship between teachers’ VAM and observational scores only accounts for about 8% of the variation in VAM score. Note: we get 8% by squaring the aforementioned r = 0.28 correlation (i.e., an R squared). The other 92% of the variance is due to error and other factors. What this means in practice is that when correlations are this “weak,” it is reasonable to say statements about averages, for example, that “on average” as one variable increases the mean of the other variable increases, but it would not be prudent or wise to make predictions for individuals based on these data. 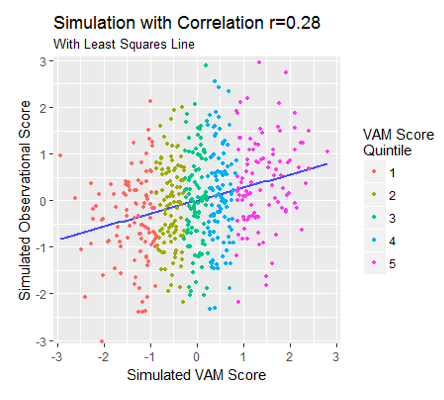 See, for example, that individuals in the top 20% (quintile 5) of VAM have a very large spread in their scores on the observational score, with 95% of the scores in the top quintile being in between the 7th and 98th percentiles for their observational scores. So, here if we observe a VAM for a specific teacher in the top 20%, and we do not know their observational score, we cannot say much more than their observational score is likely to be in the top 90%. Similarly, if we observe a VAM in the bottom 20%, we cannot say much more than their observational score is likely to be somewhere in the bottom 90%. That’s not saying a lot, in terms of precision, but also in terms of practice. The second scatterplot I ran to test how bias that only impacts a small group of teachers might theoretically impact an overall correlation, as posited by Audrey. Here I simulated a situation where, again, there are two values present in a population of teachers: a teacher’s value-added and a teacher’s observational score. Then I insert a group of teachers (as Audrey described) who represent 20% of a population and teach a disproportionate number of students who come from relatively lower socioeconomic, high racial minority, etc. backgrounds, and I assume this group is measured with negative bias on both indicators and this group has a moderate correlation between indicators of r = 0.50. The other 80% of the population is assumed to be uncorrelated. Note: for this demonstration I assume that this group includes 20% of teachers from the aforementioned population, these teachers I assume to be measured with negative bias (by one standard deviation on average) on both measures, and, again, I set their correlation at r = 0.50 with the other 80% of teachers at a correlation of zero. What you can see is that if there is bias in this correlation that impacts only a certain group on the two instrument indicators; hence, it is possible that this bias can result in an observed correlation overall. In other words, a strong correlation noted in just one group of teachers (i.e., teachers scoring the lowest on their value-added and observational indicators in this case) can be relatively stronger than the “weak” correlation observed on average or overall. Another, possible situation is that there might be a non-linear relationship between these two measures. 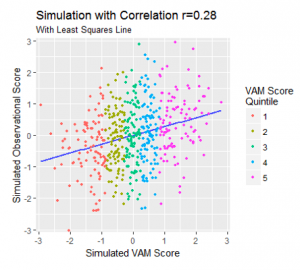 In the simulation below, I assume that different quantiles on VAM have a different linear relationship with the observational score. 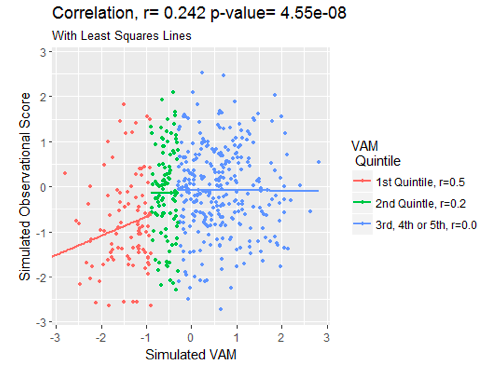 For example, in the plot there is not a constant slope, but teachers who are in the first quintile on VAM I assume to have a correlation of r = 0.50 with observational scores, the second quintile I assume to have a correlation of r = 0.20, and the other quintiles I assume to be uncorrelated. This results in an overall correlation in the simulation of r = 0.24, with a very small p-value (i.e. a very small chance that a correlation of this size would be observed by random chance alone if the true correlation was zero). 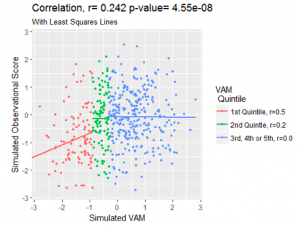 What this means in practice is that if, in fact, there is a non-linear relationship between teachers’ observational and VAM scores, this can induce a small but statistically significant correlation. 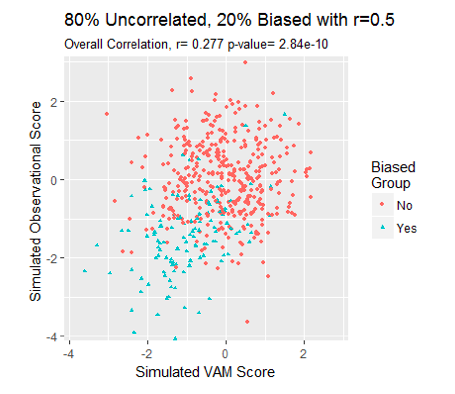 As evidenced, teachers in the lowest 20% on the VAM score have differences in the mean observational score depending on the VAM score (a moderate correlation of r = 0.50), but for the other 80%, knowing the VAM score is not informative as there is a very small correlation for the second quintile and no correlation for the upper 60%. 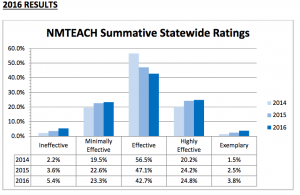 So, if quintile cut-off scores are used, teachers can easily be misclassified. In sum, Pearson Correlations (the standard correlation coefficient) measure the overall strength of linear relationships between X and Y, but if X and Y have a non-linear relationship (like as illustrated in the above), this statistic can be very misleading. Note also that for all of these simulations very small p-values are observed (e.g., p-values <0.0000001 which, again, mean these correlations are statistically significant or that the probability of observing correlations this large by chance if the true correlation is zero, is nearly 0%). What this illustrates, again, is that correlations (especially correlations this small) are (still) often misleading. While they might be statistically significant, they might mean relatively little in the grand scheme of things (i.e., in terms of practical significance; see also “The Difference Between”Significant’ and ‘Not Significant’ is not Itself Statistically Significant” or posts on Andrew Gelman’s blog for more discussion on these topics if interested). At the end of the day r = 0.28 is still a “weak” correlation. In addition, it might be “weak,” on average, but much stronger and statistically and practically significant for teachers in the bottom quintiles (e.g., teachers in the bottom 20%, as illustrated in the final figure above) typically teaching the highest needs students. Accordingly, this might be due, at least in part, to bias. In conclusion, one should always be wary of claims based on “weak” correlations, especially if they are positioned to be stronger than industry standards would classify them (e.g., in the case highlighted in the prior post). Even if a correlation is “statistically significant,” it is possible that the correlation is the result of bias, and that the relationship is so weak that it is not meaningful in practice, especially when the goal is to make high-stakes decisions about individual teachers. Accordingly, when you see correlations this small, keep these scatterplots in mind or generate some of your own (see, for example, here to dive deeper into what these correlations might mean and how significant these correlations might really be). *Please contact Dr. Kapitula directly at kapitull@gvsu.edu if you want more information or to access the R code she used for the above. You might recall that in 2009, The New Teacher Project published a highly influential “Widget Effect” report in which researchers (see citation below) evidenced that 99% of teachers (whose teacher evaluation reports they examined across a sample of school districts spread across a handful of states) received evaluation ratings of “satisfactory” or higher. Inversely, only 1% of the teachers whose reports researchers examined received ratings of “unsatisfactory,” even though teachers’ supervisors could identify more teachers whom they deemed ineffective when asked otherwise. Accordingly, this report was widely publicized given the assumed improbability that only 1% of America’s public school teachers were, in fact, ineffectual, and given the fact that such ineffective teachers apparently existed but were not being identified using standard teacher evaluation/observational systems in use at the time. Hence, this report was used as evidence that America’s teacher evaluation systems were unacceptable and in need of reform, primarily given the subjectivities and flaws apparent and arguably inherent across the observational components of these systems. This reform was also needed to help reform America’s public schools, writ large, so the logic went and (often) continues to go. While binary constructions of complex data such as these are often used to ground simplistic ideas and push definitive policies, ideas, and agendas, this tactic certainly worked here, as this report (among a few others) was used to inform the federal and state policies pushing teacher evaluation system reform as a result (e.g., Race to the Top (RTTT)). Likewise, this report continues to be used whenever a state’s or district’s new-and-improved teacher evaluation systems (still) evidence “too many” (as typically arbitrarily defined) teachers as effective or higher (see, for example, an Education Week article about this here). Although, whether in fact the systems have actually been reformed is also of debate in that states are still using many of the same observational systems they were using prior (i.e., not the “binary checklists” exaggerated in the original as well as this report, albeit true in the case of the district of focus in this study). The real “reforms,” here, pertained to the extent to which value-added model (VAM) or other growth output were combined with these observational measures, and the extent to which districts adopted state-level observational models as per the centralized educational policies put into place at the same time. Nonetheless, now eight years later, Matthew A. Kraft – an Assistant Professor of Education & Economics at Brown University and Allison F. Gilmour – an Assistant Professor at Temple University (and former doctoral student at Vanderbilt University), revisited the original report. Just published in the esteemed, peer-reviewed journal Educational Researcher (see an earlier version of the published study here), Kraft and Gilmour compiled “teacher performance ratings across 24 [of the 38, including 14 RTTT] states that [by 2014-2015] adopted major reforms to their teacher evaluation systems” as a result of such policy initiatives. They found that “the percentage of teachers rated Unsatisfactory remains less than 1%,” except for in two states (i.e., Maryland and New Mexico), with Unsatisfactory (or similar) ratings varying “widely across states with 0.7% to 28.7%” as the low and high, respectively (see also the study Abstract). Related, Kraft and Gilmour found that “some new teacher evaluation systems do differentiate among teachers, but most only do so at the top of the ratings spectrum” (p. 10). More specifically, observers in states in which teacher evaluation ratings include five versus four rating categories differentiate teachers more, but still do so along the top three ratings, which still does not solve the negative skew at issue (i.e., “too many” teachers still scoring “too well”). They also found that when these observational systems were used for formative (i.e., informative, improvement) purposes, teachers’ ratings were lower than when they were used for summative (i.e., final summary) purposes. Clearly, the assumptions of all involved in this area of policy research come into play, here, akin to how they did in The Bell Curve and The Bell Curve Debate. During this (still ongoing) debate, many fervently debated whether socioeconomic and educational outcomes (e.g., IQ) should be normally distributed. What this means in this case, for example, is that for every teacher who is rated highly effective there should be a teacher rated as highly ineffective, more or less, to yield a symmetrical distribution of teacher observational scores across the spectrum. 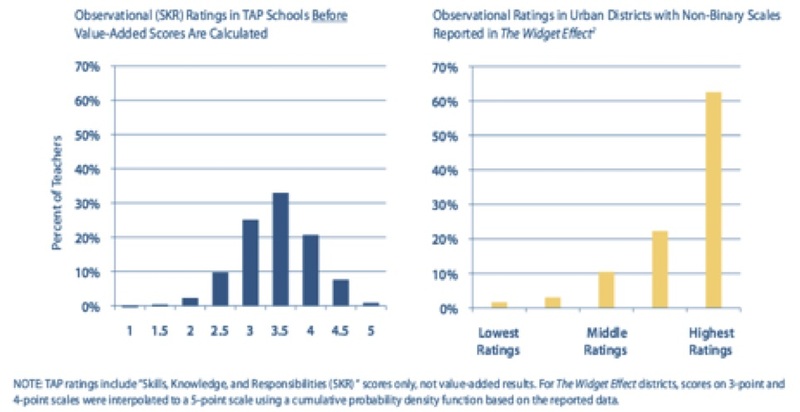 In fact, one observational system of which I am aware (i.e., the TAP System for Teacher and Student Advancement) is marketing its proprietary system, using as a primary selling point figures illustrating (with text explaining) how clients who use their system will improve their prior “Widget Effect” results (i.e., yielding such normal curves; see Figure below, as per Jerald & Van Hook, 2011, p. 1). Evidence also suggests that these scores are also (sometimes) being artificially deflated to assist in these attempts (see, for example, a recent publication of mine released a few days ago here in the (also) esteemed, peer-reviewed Teachers College Record about how this is also occurring in response to the “Widget Effect” report and the educational policies that follows). I also highly doubt that, as per New Mexico’s acting Secretary of Education, this was “not [emphasis added] designed with quote unquote end results in mind.” That is, “the New Mexico Public Education Department did not set out to place any specific number or percentage of teachers into a given category.” If true, it’s pretty miraculous how this simply worked out as illustrated… This is also at issue in the lawsuit in which I am involved in New Mexico, in which the American Federation of Teachers won an injunction in 2015 that still stands today (see more information about this lawsuit here). Indeed, as per Kraft, all of this “might [and possibly should] undercut the potential for this differentiation [if ultimately proven artificial, for example, as based on statistical or other pragmatic deflation tactics] to be seen as accurate and valid” (as quoted here). Notwithstanding, Kraft and Gilmour, also as part (and actually the primary part) of this study, “present original survey data from an urban district illustrating that evaluators perceive more than three times as many teachers in their schools to be below Proficient than they rate as such.” Accordingly, even though their data for this part of this study come from one district, their findings are similar to others evidenced in the “Widget Effect” report; hence, there are still likely educational measurement (and validity) issues on both ends (i.e., with using such observational rubrics as part of America’s reformed teacher evaluation systems and using survey methods to put into check these systems, overall). In other words, just because the survey data did not match the observational data does not mean either is wrong, or right, but there are still likely educational measurement issues. Also of issue in this regard, in terms of the 1% issue, is (a) the time and effort it takes supervisors to assist/desist after rating teachers low is sometimes not worth assigning low ratings; (b) how supervisors often give higher ratings to those with perceived potential, also in support of their future growth, even if current evidence suggests a lower rating is warranted; (c) how having “difficult conversations” can sometimes prevent supervisors from assigning the scores they believe teachers may deserve, especially if things like job security are on the line; (d) supervisors’ challenges with removing teachers, including “long, laborious, legal, draining process[es];” and (e) supervisors’ challenges with replacing teachers, if terminated, given current teacher shortages and the time and effort, again, it often takes to hire (ideally more qualified) replacements. Steinberg, M. P., & Kraft, M. A. (forthcoming). The sensitivity of teacher performance ratings to the design of teacher evaluation systems. Educational Researcher. Weisberg, D., Sexton, S., Mulhern, J., & Keeling, D. (2009). “The Widget Effect.” Education Digest, 75(2), 31–35. A colleague recently sent me a report released in November of 2016 by the Institute of Education Sciences (IES) division of the U.S. Department of Education that should be of interest to blog followers. The study is about “The content, predictive power, and potential bias in five widely used teacher observation instruments” and is authored by affiliates of Mathematica Policy Research. Using data from the Bill & Melinda Gates Foundation’s Measures of Effective Teaching (MET) studies, researchers examined five widely used teacher observation instruments. Instruments included the more generally popular Classroom Assessment Scoring System (CLASS) and Danielson Framework for Teaching (of general interest in this post), as well as the more subject-specific instruments including the Protocol for Language Arts Teaching Observations (PLATO), the Mathematical Quality of Instruction (MQI), and the UTeach Observational Protocol (UTOP) for science and mathematics teachers. Researchers examined these instruments in terms of (1) what they measure (which is not of general interest in this post), but also (2) the relationships of observational output to teachers’ impacts on growth in student learning over time (as measured using a standard value-added model (VAM)), and (3) whether observational output are biased by the characteristics of the students non-randomly (or in this study randomly) assigned to teachers’ classrooms. As per #2 above, researchers found that the instructional practices captured across these instruments modestly [emphasis added] correlate with teachers’ value-added scores, with an adjusted (and likely, artificially inflated; see Note 1 below) correlation coefficient between observational and value added indicators at: 0.13 ≤ r ≤ 0.28 (see also Table 4, p. 10). As per the higher, adjusted r (emphasis added; see also Note 1 below), they found that these instruments’ classroom management dimensions most strongly (r = 0.28) correlated with teachers’ value-added. Related, also at issue here is that such correlations are not “modest,” but rather “weak” to “very weak” (see Note 2 below). While all correlation coefficients were statistically significant, this is much more likely due to the sample size used in this study versus the actual or practical magnitude of these results. “In sum” this hardly supports the overall conclusion that “observation scores predict teachers’ value-added scores” (p. 11); although, it should also be noted that this summary statement, in and of itself, suggests that the value-added score is the indicator around which all other “less objective” indicators are to revolve. As per #3 above, researchers found that students randomly assigned to teachers’ classrooms (as per the MET data, although there was some noncompliance issues with the random assignment employed in the MET studies) do bias teachers’ observational scores, for better or worse, and more often in English language arts than in mathematics. More specifically, they found that for the Danielson Framework and CLASS (the two more generalized instruments examined in this study, also of main interest in this post), teachers with relatively more racial/ethnic minority and lower-achieving students (in that order, although these are correlated themselves) tended to receive lower observation scores. Bias was observed more often for the Danielson Framework versus the CLASS, but it was observed in both cases. An “alternative explanation [may be] that teachers are providing less-effective instruction to non-White or low-achieving students” (p. 14). Notwithstanding, and in sum, in classrooms in which students were randomly assigned to teachers, teachers’ observational scores were biased by students’ group characteristics, which also means that bias is also likely more prevalent in classrooms to which students are non-randomly assigned (which is common practice). These findings are also akin to those found elsewhere (see, for example, two similar studies here), as this was also evidenced in mathematics, which may also be due to the random assignment factor present in this study. In other words, if non-random assignment of students into classrooms is practice, a biasing influence may (likely) still exist in English language arts and mathematics. The long and short of it, though, is that the observational components of states’ contemporary teacher systems certainly “add” more “value” than their value-added counterparts (see also here), especially when considering these systems’ (in)formative purposes. But to suggest that because these observational indicators (artificially) correlate with teachers’ value-added scores at “weak” and “very weak” levels (see Notes 1 and 2 below), that this means that these observational systems might “add” more “value” to the summative sides of teacher evaluations (i.e., their predictive value) is premature, not to mention a bit absurd. Adding import to this statement is the fact that, as s duly noted in this study, these observational indicators are oft-to-sometimes biased against teachers who teacher lower-achieving and racial minority students, even when random assignment is present, making such bias worse when non-random assignment, which is very common, occurs. Hence, and again, this does not make the case for the summative uses of really either of these indicators or instruments, especially when high-stakes consequences are to be attached to output from either indicator (or both indicators together given the “weak” to “very weak” relationships observed). On the plus side, though, remain the formative functions of the observational indicators. Note 1: Researchers used the “year-to-year variation in teachers’ value-added scores to produce an adjusted correlation [emphasis added] that may be interpreted as the correlation between teachers’ average observation dimension score and their underlying value added—the value added that is [not very] stable [or reliable] for a teacher over time, rather than a single-year measure (Kane & Staiger, 2012)” (p. 9). This practice or its statistic derived has not been externally vetted. Likewise, this also likely yields a correlation coefficient that is falsely inflated. Both of these concerns are at issue in the ongoing New Mexico and Houston lawsuits, in which Kane is one of the defendants’ expert witnesses in both cases testifying in support of his/this practice. Note 2: As is common with social science research when interpreting correlation coefficients: 0.8 ≤ r ≤ 1.0 = a very strong correlation; 0.6 ≤ r ≤ 0.8 = a strong correlation; 0.4 ≤ r ≤ 0.6 = a moderate correlation; 0.2 ≤ r ≤ 0.4 = a weak correlation; and 0 ≤ r ≤ 0.2 = a very weak correlation, if any at all. Earlier today I released a post regarding “A Big Victory in Court in Houston,” in which I wrote about how, yesterday, US Magistrate Judge Smith ruled — in Houston Federation of Teachers et al. v. Houston Independent School District — that Houston teacher plaintiffs’ have legitimate claims regarding how their Education Value-Added Assessment System (EVAAS) value-added scores, as used (and abused) in HISD, was a violation of their Fourteenth Amendment due process protections (i.e., no state or in this case organization shall deprive any person of life, liberty, or property, without due process). Hence, on this charge, this case is officially going to trial. Well, also yesterday, “we” won another court case on which I also served as an expert witness (I served as an expert witness on behalf of the plaintiffs alongside Jesse Rothstein in the court case noted above). As per this case — Texas State Teachers Association v. Texas Education Agency, Mike Morath in his Official Capacity as Commissioner of Education for the State of Texas (although there were three similar cases also filed – see all four referenced below) — The Honorable Lora J. Livingston ruled that the Defendants are to make revisions to 19 Tex. Admin. Code § 150.1001 that most notably include the removal of (A) student learning objectives [SLOs], (B) student portfolios, (C) pre and post test results on district level assessments; or (D) value added data based on student state assessment results. In addition, “The rules do not restrict additional factors a school district may consider…,” and “Under the local appraisal system, there [will be] no required weighting for each measure…,” although districts can chose to weight whatever measures they might choose. “Districts can also adopt an appraisal system that does not provide a single, overall summative rating.” That is, increased local control. If the Texas Education Agency (TEA) does not adopt the regulations put forth by the court by next October, this case will continue. This does not look likely, however, in that as per a news article released today, here, Texas “Commissioner of Education Mike Morath…agreed to revise the [states’] rules in exchange for the four [below] teacher groups’ suspending their legal challenges.” As noted prior, the terms of this settlement call for the removal of the above-mentioned, state-required, four growth measures when evaluating teachers. This was also highlighted in a news article, released yesterday, here, with this one more generally about how teachers throughout Texas will no longer be evaluated using their students’ test scores, again, as required by the state. At the crux of this case, as also highlighted in this particular piece, and to which I testified (quite extensively), was that the value-added measures formerly required/suggested by the state did not constitute teachers’ “observable,” job-related behaviors. See also a prior post about this case here. 4. Association of Texas Professional Educators v. Mike Morath, the Commissioner of Education and the Texas Education Agency; in the 200th District Court of Travis County, Texas. Last week I spent a few days in Austin, one day during which I provided expert testimony for a new state-level lawsuit that has the potential to impact teachers throughout Texas. The lawsuit — Texas State Teachers Association (TSTA) v. Texas Education Agency (TEA), Mike Morath in his Official Capacity as Commissioner of Education for the State of Texas. The key issue is that, as per the state’s Texas Education Code (Sec. § 21.351, see here) regarding teachers’ “Recommended Appraisal Process and Performance Criteria,” The Commissioner of Education must adopt “a recommended teacher appraisal process and criteria on which to appraise the performance of teachers. The criteria must be based on observable, job-related behavior, including: (1) teachers’ implementation of discipline management procedures; and (2) the performance of teachers’ students.” As for the latter, the State/TEA/Commissioner defined, as per its Texas Administrative Code (T.A.C., Chapter 15, Sub-Chapter AA, §150.1001, see here), that teacher-level value-added measures should be treated as one of the four measures of “(2) the performance of teachers’ students;” that is, one of the four measures recognized by the State/TEA/Commissioner as an “observable” indicator of a teacher’s “job-related” performance. While currently no district throughout the State of Texas is required to use a value-added component to assess and evaluate its teachers, as noted, the value-added component is listed as one of four measures from which districts must choose at least one. All options listed in the category of “observable” indicators include: (A) student learning objectives (SLOs); (B) student portfolios; (C) pre- and post-test results on district-level assessments; and (D) value-added data based on student state assessment results. Related, the state has not recommended or required that any district, if the value-added option is selected, to choose any particular value-added model (VAM) or calculation approach. Nor has it recommended or required that any district adopt any consequences as attached to these output; however, things like teacher contract renewal and sharing teachers’ prior appraisals with other districts in which teachers might be applying for new jobs is not discouraged. Again, though, the main issue here (and the key points to which I testified) was that the value-added component is listed as an “observable” and “job-related” teacher effectiveness indicator as per the state’s administrative code. If any of you have anything to add to this, please do so in the comments section of this post. Otherwise, I will keep you posted on how this goes. My current understanding is that this one will be headed to court.